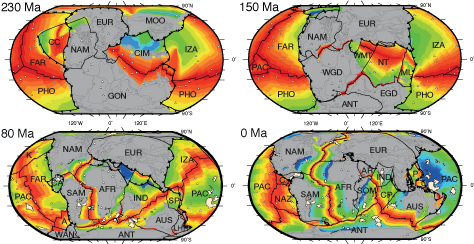 We present a revised global plate motion model with continuously closing plate boundaries ranging from the Triassic at 230 Ma to the present day, assess differences between alternative absolute plate motion models, and review global tectonic events. Relatively high mean absolute plate motion rates around 9–10 cm yr-1 between 140 and 120 Ma may be related to transient plate motion accelerations driven by the successive emplacement of a sequence of large igneous provinces during that time. A ~100 Ma event is most clearly expressed in the Indian Ocean and may reflect the initiation of Andean-style subduction along southern continental Eurasia, while an ~80 Ma acceleration of mean rates from 6 to 8 cm yr-1 reflects the initial northward acceleration of India and simultaneous speedups of plates in the Pacific. An event at ~50 Ma expressed in relative, and some absolute plate motion changes around the globe and in a reduction of global mean velocities from about 6 to 4–5 cm yr-1, indicates that an increase in collisional forces (such as the India-Eurasia collision) and ridge subduction events in the Pacific (such as the Izanagi-Pacific Ridge) play a significant role in modulating plate velocities. v1.10 – Some minor fixes were made to plate topologies, and so conforms to the originally-published model. v1.11 – A back-arc basin north of Arabia was introduced in the Cretaceous (see note below), and hence slightly diverges from the original model in plate topologies, velocities, and seafloor age-grids for this region. v1.14 – The latest version of the model that has duplicated topology segments cleaned from the evolving polygons, which helps with quantifying plate boundary lengths in the resolved topology output. Note about the evolution of the western Tethys in this model: The Western Tethys, north of Arabia, is punctuated by ophiolite formation and obduction in Cretaceous times. The first end-member involves applying the central and eastern Tethys analogues of back-arc opening and closure following ophiolite obduction, much like is usually implied in the Kohistan-Ladakh and Greater India collision zone. This scenario makes the Western Tethys north of Arabia consistent with the model of the eastern Tethys. 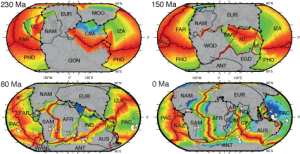 However, a second end-member interpretation for the formation of many of the ophiolites in the region is that they develop when a mid-oceanic ridge inverts to become a subduction zone. Both options are plausible, but we implemented a change in this plate model after it was published to reflect the first end-member scenario in order to link the region to the eastern Tethys in a plausible way. This scenario is based on back-arc opening from ~125 Ma (Jolivet et al., 2016), with subduction of back-arc initiating in Albian times from ~110 Ma (Ghazi et at., 2003; Aygul et al., 2015). Obduction and Arabia collision with an arc occurs at 85 Ma (Jolivet et al., 2016; Jagoutz et al., 2016). The scenario is also consistent with the recent work of Morris et al. (2016) on the Oman Ophiolite.